This scales inversely as λex4, making a good case for visible or even UV excitation. In reality, however, other factors tend to dominate choice of λex, from the considerations below to the high cost and short lifetime of compact UV lasers (not to mention the fire hazard!). Use of a shorter λex will require use of a steeper optical filter to eliminate scattered laser light for samples with Raman peaks of interest that are close to the laser line. For Raman peaks at less than 200-250 cm-1, a custom probe or spectrometer configuration may be needed. Sample heating can be an issue for longer λex, particularly for highly pigmented or darkly colored samples. This can damage the sample, or cause changes in structure for delicate organic or biological samples. Care must also be taken with UV excitation power to avoid sample burning or degradation. 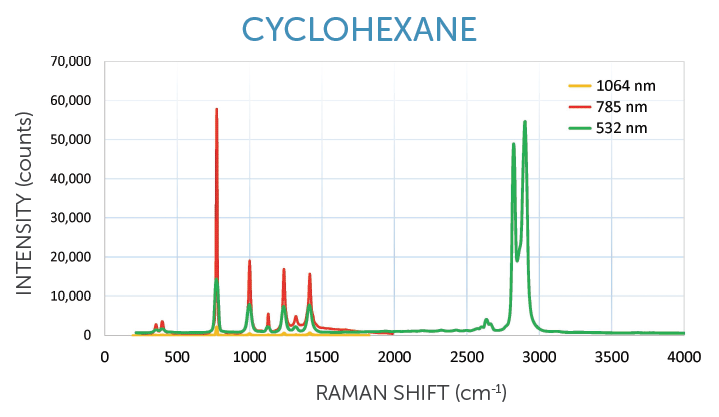 A sample’s Raman spectrum will cover a smaller wavelength range at shorter λex. Raman peak widths will also appear narrower as λex decreases, requiring better resolution of the spectrometer to resolve two adjacent Raman peaks. Spectral resolution tends to be more important for research applications than for materials identification, which often looks at the fingerprint region from 200-2000 cm-1. 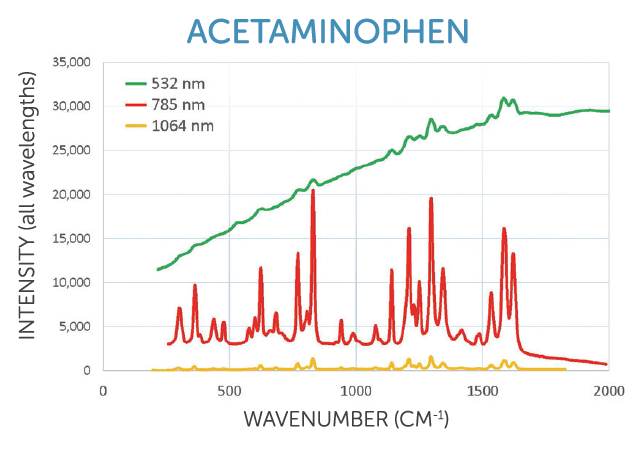 Of all the factors to be considered in selecting an excitation wavelength, sample fluorescence is perhaps the most important. Here’s why. A shorter λex has a greater chance of exciting an electronic transition in the sample, particularly for organic samples or biomaterials. The result is an increase in background due to fluorescence of the sample. The signal to noise of the spectrum may be decreased, or Raman peaks may not be visible at all above the background. Fluorescence is almost entirely suppressed when using NIR excitation, but system cost increases while sensitivity goes down. Why not simply subtract fluorescence background? Photobleaching of the sample can cause background fluorescence to decrease over time. While this may seem appealing, it cannot always be done dependably or without altering the sample. 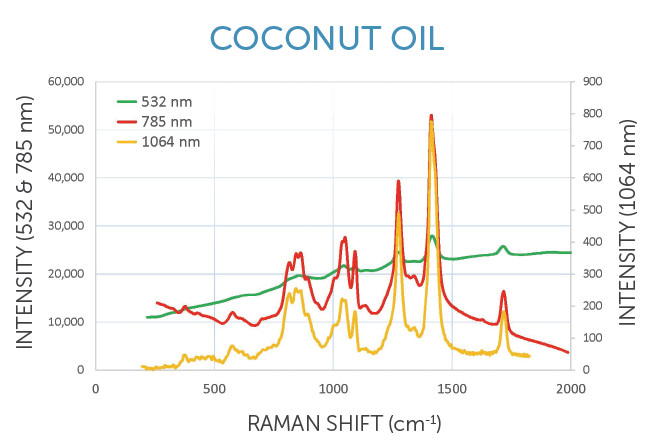 The right excitation wavelength makes all the difference in Raman spectroscopy. Wasatch Photonics offers the expertise & testing to find your optimal Raman solution. Contact us to get started!